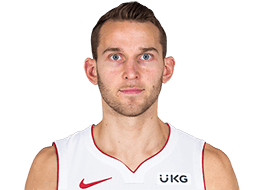 Selected by the Sacramento Kings in the first round with the 8th overall pick in the 2014 draft...Traded to the 76ers, along with Carl Landry and Jason Thompson in exchange for Arturas Gudaitis and Luka Mitrovic on July 9, 2015. Appeared in 73 games as a rookie with the Kings, logging one start...highest point total came when he scored 15 points on two separate occasions (12/8 against Utah and 3/3 against New York). Appeared in 73 games for the Sixers, starting 35...scored a career-high 23 points against the Oklahoma City Thunder on 3/18...scored 10 points or more 30 times throughout the season. Son of Paul and Ruta...A native of Mississauga, Ontario...Represents Canada in national play. 2012-13 Season: Stauskas appeared in 39 games as a first-year member of Michigan...Shot .440 from three-point range, and .463 from the field...Led the Big 10 in games played.